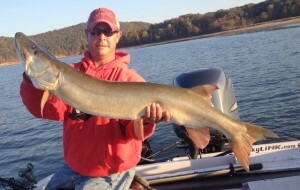 The guide staff of Kentucky Mountain Muskies and the Muskie Lodge have been hand picked to create the finest group of muskie anglers on Cave Run Lake and are second to none. Compiling a staff of guides that can be found on the lake whether they have paid trips or not. With their clients first and foremost, these guys offer a very entertaining and educational day on the water. They are not there for them to catch the fish. I take pride in the guys that represent the lodge and very proud of this group and their qualifications. Booking a day with any of them will be a great muskie fishing experience. Tony Grant has been musky fishing on Kentucky’s Cave Run Lake for nearly 30 years and began guiding on The Cave in 1990. In 2001, Tony began seasonally guiding the waters of Canada, Minnesota and Wisconsin. He spends nearly 200 days on the water and gives dozens of enlightening seminars each year. Tony has a solid history of fishing the PMTT Ranger Boats Championship Qualifiers, having fished the tournament since it first started in 1999. Tony placed 1st in the PMTT 2002 Mercury Marine Eagle River Summer Challenge and 1st in St. Croix River’s 2009 PMTT Musky Hunter Magazine Fall Meltdown. An impressive tour leader with 14 PMTT Ranger Boat Championship qualifications; Tony also boasts numerous top ten finishes, as well as 4 top 10 rankings for the PMTT’s Team of the Year award. While fishing the Professional Musky Tournament Trail, Tony also placed 1st in both the 2002 and 2008 Cabin Fever Challenge at Kentucky’s Green River Lake and in 2008, with partner Dave Schultz, the team took 1st Place in the IMTT’s Spring Classic. Tony is a talented speaker, educator and writer. In his travels through musky country, Tony has educated thousands of novice and seasoned musky hunters. Most of these adventure seekers come to hear his entertaining and educational seminars at musky and fishing expositions and Muskies Inc. club meetings. While many others visit him booth-side to discuss the next season’s strategy. 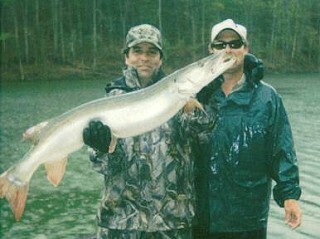 In 2006, Tony teamed up with Gregg Thomas to form Musky Road Rules, a series of “Cabin Fever Clinics” and “On the Water Workshops”, across the mid-west musky range. Tony has also been seen on Mike Keyes Outdoors, Bad Fish videos and Musky Hunter TV. His educational articles have been published in Mid West Outdoors, The Outdoor Notebook, and The Southern Sporting Journal. He has been a contributing writer for Musky Hunter Magazine since 1997 and has been Field Editor for Musky Hunter since 2008. 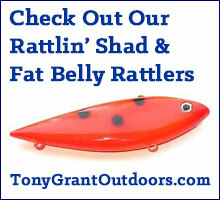 Tony’s love for rattle baiting pre-spawn muskies led him to develop a Rattlin’ product line with proven results. Tony Grant Outdoors Southern Series Lures has been producing baits such as the Rattlin’ Shad, Super Rattlin’ Shad and the Fat Belly Rattler for the past 15 years with much success. Tony’s sponsors include Amsoil, Okuma, Musky Mayhem, High Seas, Musky Innovations, Grim Reaper, Savage, Frabill, Chaos Tackle, Red October and Power Pole. A guided trip with Tony provides anglers with a truly memorable experience and a host of tips, tricks and tactics to help guide them on their quest to capture the mighty muskellunge. Over the years, Tony has had the pleasure of fishing and strategizing with some of the world’s top musky fishermen and women and relishes any opportunity to teach the upcoming generation of musky hunters to be responsible and agile fishermen. 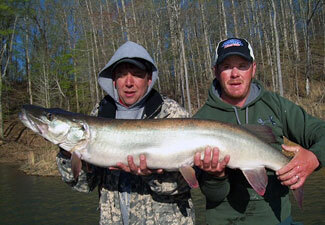 You can join Tony, his guides and clients at Tony’s Mountain Muskie Lodge at Cave Run Lake. Mountain Muskie Lodge provides comfortable accommodations for guests, including access to the Lodge’s “Great” room with a fully equipped kitchen, pool table and entertaining area. In the Spring and Fall, Tony, his guides and guests alike, gather at the Mountain Muskie Lodge for musky mentorship, comradery, story swapping, down-home cooking and overall, a memory you will not soon forget. Scott has been fishing Cave Run and its tributaries since childhood with his father, Larry Salchli. He started his muskie fishing career at the tender age of 8 with twenty legal size fish by the age of 12. Now his step daughter Sara Terry holds the Current Kentucky State Record caught while on a day on the lake with Scott. Scott shares his fishing knowledge with Kentucky youths through local organizations year after year. Scott is a full time employee of Coca Cola and was able to start guiding part time over 10 years ago. He now spends nearly 100 days per year guiding and competitive angling. He is viewed by many as one of the best muskie anglers on Cave Run and has shown his skills while competing in the PMTT with several top ten finishes and a victory on the Madison Chain in Wisconsin. Scott also has taken many top spots in Kentucky’s Trinity trail. To add to his accomplishments, with KSMC he has been awarded Largest Release in 1999, 2002, and 2003. Most Released in 1999 and 2000. He also has been awarded the Largest Release in the state of Kentucky in 2002. In March 2002, he received the International award for Lunker of the Month. Maybe his most notable accomplishment is a PMTT record setter. Scott and partner Anthony Smith, have become the only team in the PMTT’s history to land legal fish in each of the 2004 qualifying events. This feat has never been done before in the 6 year history of the trail. Charlie Thompson was born and raised in eastern Kentucky was taught musky fishing from his grandpa a legendary river and creek muskie angler from the early days. 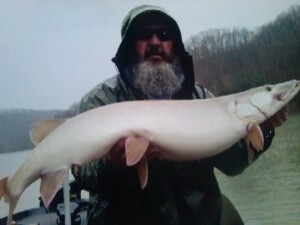 Charlie has been seen for over 20 years casting for Cave Run’s muskies. His back home, down to earth approach to guiding has been experienced by anglers all over, for well over a decade. He has shown his skills in the Professional Musky Tournament Trail with top ten finishes, truly one of the “GREAT GUYS” on Cave Run Lake. 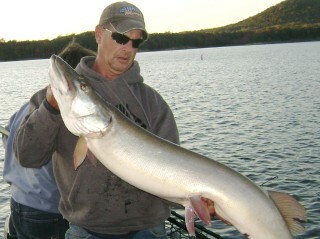 Charlie can be heard at Mountain Muskie Lodge “pick in and a grin in” at most of our outings. Darrell has been fishing Cave Run Lake for fifteen years. His obsession with musky fishing began when a friend asked Darrell to take him turkey hunting and in return, he would take Darrell on his first adventure of musky fishing. From the first day, he was “hooked”. Although he is not a full-time fishing guide, he is able to spend the majority of his time on the lake during peak seasons as well as most weekends. Lance has been chasing these fish since the age of 14 and once he caught his first muskie he knew there was no other fish that he wanted to catch. He has been guiding anglers of all experience levels from beginner to the seasoned angler for the last 6 years. Lance also is a tournament angler and has participated in the PMTT every year since 2004 and also participating in the Trinity Muskie Trail and winning the May 2008 Green River Tournament and along with his partner (his father Darrell Seasor) finished 3rd in the championship of the 2008 Trinity Muskie Trail. Lance is the son of another one of our guides, Darrell Seasor. Like father like son, they share the same passion. You can see one of these guys or both, nearly any day on Cave Run. Their obsession has them on the water almost every day whether guiding or not. Jason grew up fishing the lakes, creeks and streams in the Cave Run area. Over 20 years ago he was bit by the muskie bug and has spend an enormous amount of time on Cave Run Lake in pursuit of them. Jason has guided customers to some great catches for well over 10 years now. Jason and his clients enjoy casting, trolling and Jason’s favorite live bait fishing in the fall. Mike started his muskie ﬁshing adventures at a young age with his father and uncle in Northern Wisconsin. 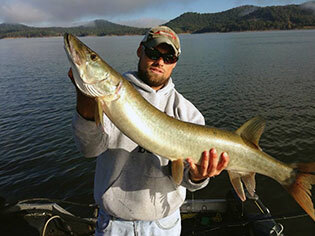 Over the past 6 years his efforts have been targeted on Cave Run muskies. While only in his fourth year of guiding (Two Scoops) has landed plenty of great southern muskies for his clients. Mikie’s outstanding personality makes a day on the water with him entertaining and educational. Frank plainly put, loves muskie fishing. Over the years, he has put countless numbers of hours chasing the king of freshwater fish. He has been a member of our guide staff for over 4 years and taking kids fishing is one of his favorite guiding experiences. Frank enjoys both trolling and casting for muskies and with his laid back personality is a very good teacher. Justin has been muskie crazy since the age of 11 when he started fishing with his dad. Soon after, at such a young age, he landed his first fifty plus incher. His love for muskie fishing finds him spending all his extra time chasing his favorite fish. He has traveled to as far away as Minnesota and Canada in pursuit of a giant catch. Over the past several years Justin has become a great addition to our guide service putting many happy clients on fish, a day on the water with him will be a great learning experience. 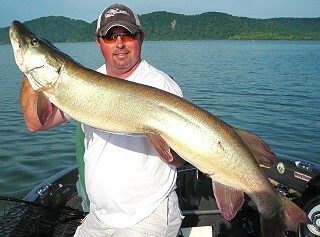 Billy has spent most of his life on Cave Run lake with muskies being his main target. His slow approach to working areas throughly has lead him to great success. 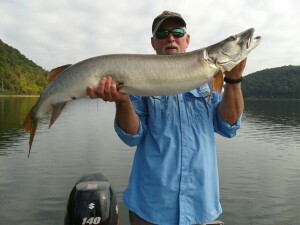 Many of Billy’s clients have caught their first or biggest muskie while sharing a boat with him. His knowledge of the lake and its tributaries are second to none. His down-home personality and understanding of the muskies and how they move seasonally will make for a great day on the water for his clients. Jimmy’s fishing started many years ago chasing smallmouth bass on Dale Hollow Lake on the Kentucky-Tennessee border. However it took just a few trips to Cave Run to convert him into a full blown musky fanatic and it has become his exclusive fish for nearly ten years now. In 2010 Jimmy will start his fourth year guiding and has been competing in the professional trail for his 6th year. Jimmy’s top PMTT finish was last year when he took Runner-UP in the Cave Run Event and landed in the money in other out-of-state events. 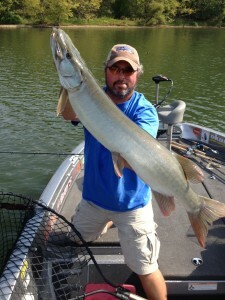 Jimmy’s clients have boated many fine muskies both trolling and casting. Joey was born with musky fishing in his blood! Musky fishing has been a part of his family’s way of life before his time. So its been embedded in him from day one! Cave Run Lake has always been his second home. Most of his best memories has been weekends camping out, surviving on bologna and peanut butter, and fishing from daylight to dark!! Over the years some of his favorite things have been taking his friends out and teaching them how to musky fish. He says there’s nothing like seeing someone hook into their first musky or their personal best. The excitement and celebrating after the catch is second to none!! The last 10 years, musky fishing has consumed all off his free time. He strives to learn everything possible about these fish and the waters of Cave Run and has become very knowledgable in learning many different ways to make these fish eat! He has been competing in the PMTT since 2009. He is a member of Muskies Inc and has won his division the past two years, along with lunker of month for February, June, and December in 2013! A day on the water with Joey will be not only educational but very entertaining. Known as Groucho, he has been muskie fishing for decades. His knowledge of this fish is second to none. Dave has been a 2 time World Champion on the PMTT circuit, as well as Top Gun twice. 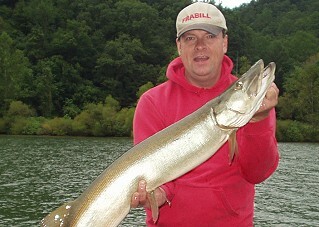 He and his clients enjoy trolling and casting for muskies. Tim has spent a lifetime hunting and fishing the Cave Run Lake area. He is known as one of the best multi species anglers in the area. Bass, crappie, white bass and of course muskies, are among his targeted fish. He has guided many trophy fish over the years. Tim also is a very successful turkey guide. He and his clients have taken hundreds of birds from the area.